This prosciutto pasta with clams in white wine sauce is as delicious as it is iconic. Land meets sea with savory Prosciutto di Parma, fresh clams and spicy jalapenos and red pepper, all softened by crisp white wine. 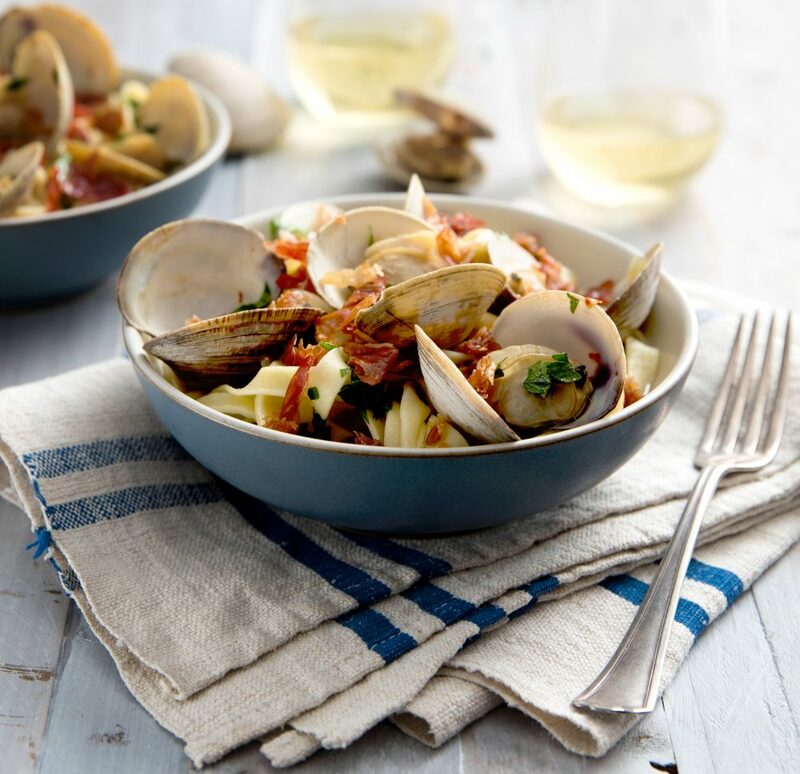 Whether you’re having it during a cold night in as a bowl of comfort food or enjoying it on the back patio during a summer sunset, this prosciutto pasta with clams is a dish you can appreciate throughout the year. No matter what time of year you choose to eat it, just be sure to serve it with some crusty Italian bread for the full clam pasta experience and don’t forget a cold beer to wash it down. Heat a large non-stick skillet over medium-high heat and cook prosciutto until crispy; reserve. In the same skillet, heat oil and cook onions until translucent. Add the jalapeno, garlic and red pepper flakes and cook until fragrant, about 1 minute. Add the clams, clam juice, wine and butter. Cover the pan with a tight-fitting lid and simmer over medium heat until the clams open, about five to seven minutes. Stir in parsley. Pour sauce over cooked pasta and toss to coat. Top with clams and reserved prosciutto. Season with sea salt and black pepper, if desired. Serve with a little bowl on the side to place the empty shells.